The NCAA tournament field has been set. Now, millions of people are filling out brackets, trying to figure out the perfect upsets and Final Four teams. Though choosing the right squads may be an exercise in futility, there's one safe bet during March Madness: college coaches make some good money. Of the 68 teams in the tournament, 47 are public universities. That means their financial records are available to the public. Those records include the salaries for their coaches. And even for the coach at the bottom of the list – that's Prairie View A&M's Byron Smith, if you're scoring at home, who made $107,000 this year – he's still doing well for himself. Each coach makes more than $2.1 million on average. In total, these 47 coaches have taken home nearly $96.3 million this year. That's not including any extra benefits or outside income, which means the total is likely well over $100 million. And that also isn't taking into account coaches at private schools, like Coach K over at Duke. He reportedly earns $7 million a year, though his salary isn't in the public domain. Here's a look at the top 10 highest-paid public coaches in this year's tournament, per information from USA Today and Business Insider. Best of luck with your brackets! This is John Calipari's tenth season at Kentucky. Six of his teams have made it to at least the Elite Eight, and the 2012 squad led by Anthony Davis won the whole tournament. If Kentucky wanted to buy him out for whatever reason, it would cost $25 million. Virginia made history last season as the first No. 1 seed to lose their opening round game against a No. 16 seed. Tony Bennett and the Cavaliers are back in the No. 1 spot this year, sporting their same tenacious defense and a much-improved offense. Will it be enough to overcome the poor showings in the tournament? Anything less than a national title might be a disappointment for this experienced team. Bennett has the second-highest buyout in college basketball – he'd get $19.8 million should Virginia decide it wants to part ways. The Cardinals' first-round matchup is against Richard Pitino and the Minnesota Golden Gophers. Yes, that's the son of Rick Pitino, who Louisville fired just 18 months ago after scandals rocked the university. Chris Mack has the Cardinals back in the tournament in his first season in Louisville. And the school paid dearly to get him – they had to give Xavier $2.9 million to buy out his contract, plus another $1 million in taxes. Between injuries and players leaving the team, this has been a rough year for Kansas. The team's 14-year Big 12 title streak finally came to an end, and they're a trendy upset pick in this year's tournament. Self's teams have certainly had their fair share of struggles as a high seed, but they're a year removed from the Final Four and last made the championship game in 2012. The Wolverines made it to the national title game in 2018 and are looking to go one step further this year. It's the second time Beilein has coached the Wolverines to the title game – he also did so in 2013. The team has made it to at least the Sweet 16 in four of the past six seasons, but flaming out that early this year might be viewed as a disappointment. Izzo and the Spartans are fresh off Big Ten regular season and conference tournament titles, having beaten their cross-state rival Michigan. The Spartans made the Elite Eight in 2014 and the Final Four in 2015, but haven't made it to the second weekend of the tournament since. They're a strong Final Four candidate this year – can they live up to expectations? For four weeks, Tennessee was the number one program in the country. The Vols haven't dropped out of the top ten of the AP or Coaches polls all season. With a loaded and experienced team, can Tennessee finally reach its first final four in men's program history? For a stretch, it looked like the Sooners might not make the tournament at all. But Lon Kruger helped get things back on track, and Oklahoma has a fairly favorable first-round match-up, at least. If he's still coaching in Norman on May 1, he'll receive an extra $600,000 "annual stay benefit." The Buckeyes suspended star Kaleb Wesson and nearly cost themselves a spot in the tournament. But they're here, and the bracket actually sets up pretty nicely for them to make a Cinderella run. Holtmann's prepping for the future, too – he offered recruit Chris Livingston a scholarship before he's even played a high school game. Williams is making an even $3 million this year, but he could earn even more next season. He's the strong favorite to take the vacant Texas A&M head coaching job. For now, he'll focus on guiding a Hokies team that defeated Duke earlier in the year – and just might face them again in the Sweet 16. John Calipari and Kentucky have agreed to a lifetime deal. How much is the head coach making at the school? 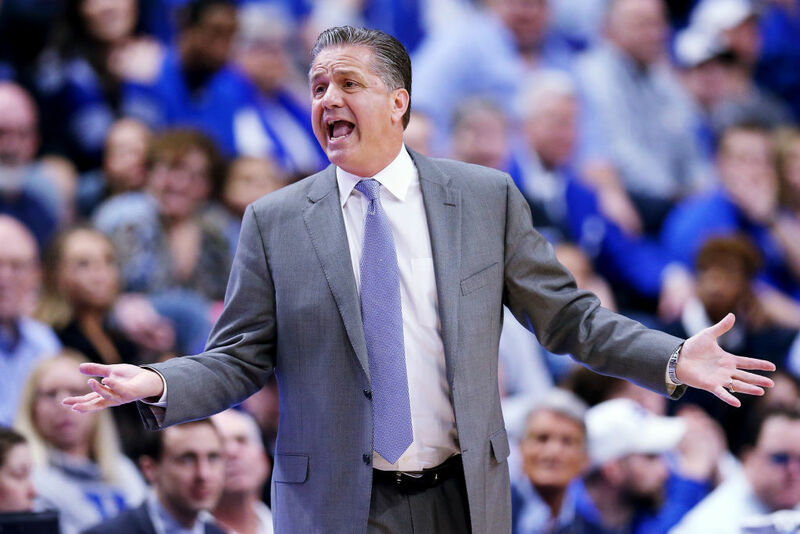 John Calipari Wants HOW MUCH Money To Return To The NBA???!!! John Calipari has accomplished just about everything at the college level. He'd love another shot at the pros, but what will it cost a team to get him there?